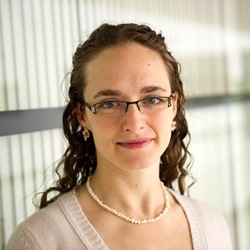 Rebecca Saxe is a Professor of Cognitive Neuroscience in the department of BCS and an associate member of the McGovern Institute. Saxe received her BA from Oxford University, and her PhD from MIT. Before joining the faculty, she was a Junior Fellow in Harvard’s Society of Fellows. Saxe has authored peer-reviewed papers on the cognitive neuroscience of social cognition, Theory of Mind, and moral judgment. Her TED talk has been viewed millions of times, and has been translated into 33 languages. She was recently named a Young Global Leader by the World Economic Forum. Externally observable components of human actions carry only a tiny fraction of the information that matters. Human observers are vastly more interested in perceiving or inferring the mental states - the beliefs, desires and intentions - that lie behind the observable shell. If a person checks her watch, is she uncertain about the time, late for an appointment, or bored with the conversation? If a person shoots his friend on a hunting trip, did he intend revenge or just mistake his friend for a partridge? The mechanism people use to infer and reason about another person’s states of mind is called a ‘Theory of Mind’ (ToM). One of the most striking discoveries of recent human cognitive neuroscience - made in our lab, and others - is that there is a group of brain regions in human cortex that selectively and specifically underlie ToM. Excitingly, most questions about these brain regions remain open. Our lab studies Theory of Mind as a case study in the deeper and broader question: how does the brain - an electrical and biological machine - construct abstract thoughts? We use functional neuroimaging, behavioural studies with kids and adults, patient studies, and transcranial magnetic stimulation to study abstract representations in the human brain. In addition to Theory of Mind, our recent research investigates brain development, moral reasoning, causal reasoning, and language. We are interested in students or post-docs with backgrounds in philosophy, computer science, or systems neuroscience, in addition to psychology and cognitive neuroscience.